Please select a size. view smaller sizesEU 37 - Low StockEU 38 - Low Stock Please select a size. 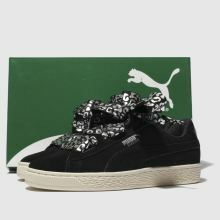 Bringing them sweet style to match their shining personality, PUMA offer the ultra-chic Suede Heart Athluxe profile. Foil branding and chunky silver animal print lacing add to the elegant black suede upper for a superbly stylish kids' trainer.